The Dragon Titan mission concept, which would send a dual quadcopter to the Saturn moon, is one of two finalists for NASA's next New Frontiers mission to explore the solar system in the mid-2020s. 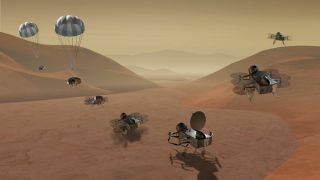 NASA has selected two ambitious finalists for its New Frontiers robotic mission program: a flying lander to soar over the surface of Saturn's big, potentially habitable moon Titan and a mission to bring back samples from a comet's icy nucleus. Both missions, chosen from 12 proposals submitted in April, will receive funding to continue developing their concepts. In 2019, one of them will be selected to fly; it will lift off before the end of 2025. Whichever mission is chosen will follow in the footsteps of three impressive New Frontiers selections, all of which are currently operational: the New Horizons mission to Pluto; the Juno probe now orbiting Jupiter; and the OSIRIS-REx asteroid sample-return mission currently on its way to the asteroid Bennu. The Dragonfly mission would send a flying, eight-rotored lander to explore Titan's hazy, hydrocarbon atmosphere and examine its surface, which is covered in methane and ethane seas and rivers. The exotic moon is very different from Earth, but its complex chemistry makes it a fascinating target to search for the development of life. The moon was previously mapped in detail by NASA's Cassini spacecraft, which flew by several times, and that mission's Huygens lander, which descended to Titan's surface in 2005. With Dragonfly's detailed measurements of the moon's composition, "we can evaluate how far prebiotic chemistry has progressed in an environment we know has the ingredients for life — for water-based life, or potentially even hydrocarbon-based life," Elizabeth Turtle, a planetary scientist at the Johns Hopkins Applied Physics Laboratory (APL) in Maryland and principal investigator for Dragonfly, said during the news conference. "Dragonfly would spend most of its time on the ground, but by being a rotorcraft, we're able to fly to multiple sites tens to hundreds of kilometers apart to be able to make these measurements in different geologic settings," she added. The lander would draw power from a compact nuclear generator called an MMRTG, like the one that powers NASA's Mars rover Curiosity. Its spacecraft would be built by APL in partnership with Penn State University, whose lab has already built models that have gone on test flights, Turtle said. After a launch in 2025, the mission would arrive at Titan in 2034 and explore for a few years. The mission wouldn't be limited by power or a dangerous environment, Turtle said. While Dragonfly would beam data home to Earth, the second mission, called Comet Astrobiology Exploration SAmple Return (CAESAR), would send icy material here: The mission would travel to the comet 67P/Churyumov-Gerasimenko, previously scoped out by Europe's Rosetta mission, and bring back at least 100 grams of sample from the comet's nucleus for analysis. The Comet Astrobiology Exploration SAmple Return, or CEASAR, mission would collect a sample from the comet 67P/ Churyumov-Gerasimenko and return it to Earth in a re-entry capsule. The mission concept is one of two finalists for NASA's next New Frontiers mission to launch in the mid-2020s. "Comets are among the most scientifically important objects in the solar system, but they're also among the most poorly understood," Steve Squyres, a researcher at Cornell University in Ithaca, New York, and principal investigator for CAESAR, said at the conference. "They're the most primitive building blocks of planets; they contain materials that date from the very earliest moments of solar system formation and even before. Comets were a source of water for the Earth's oceans, and critically they were a source of organic molecules that contributed to the origin of life." CAESAR's samples, the first ever taken of a comet nucleus, would include the volatile ices from its surface that are comets' signature feature. The spacecraft would separate its sample into different compartments for volatile and nonvolatile components, and its return to Earth would involve ditching its heat shield as it landed, after entering the atmosphere, to avoid overheating the sample. The sample capsule would be designed by JAXA, Japan's space agency, and would be based on its Hayabusa asteroid mission. The spacecraft would come from Orbital ATK and use solar-electric propulsion to make its way to the comet. Rosetta's exploration of the comet makes the mission much less risky than visiting any other comet, said Squyres, who's also the principal investigator of NASA's Mars Exploration Rover mission, which landed the golf-cart-size robots Spirit and Opportunity on the Red Planet in 2004: "We're able to say to our engineers, OK, here's the size-frequency distribution of the particles on the surface, here's how strong the surface is; we can design for specific conditions that we know to exist." "That dramatically improves the chances for success for a very difficult activity, which is grabbing a piece of a comet," he added. The mission would return to Earth on Nov. 20, 2038, unprecedented samples in tow. The CEASAR comet sample-return mission concept proposes returning a piece of comet 67P/Churyumov-Gerasimenko to Earth 14 years after the mission's launch. In addition to the two finalists, NASA officials also chose to continue funding development for two missions, but not advance them to the next step of the process: Enceladus Life Signatures and Habitability (ELSAH), led by Chris McKay of NASA's Ames Research Center in California, and Venus In situ Composition Investigations (VICI), led by Lori Glaze at NASA's Goddard Research Center in Maryland. Both missions had challenging technical aspects that needed more work, NASA officials said. For ELSAH, more work is needed to avoid contamination so the mission can better detect potential life on Saturn's icy moon. And for VICI, the challenge is to develop more technology to survive the extreme conditions on the surface of Venus, according to Jim Green, director of the planetary science division at NASA headquarters in Washington. "The New Frontiers program is really the premiere program for our principal investigators, and indeed it's one of the most difficult programs to be selected for — we fly only about two of these types of missions per decade," Green said during the conference. "These are tremendously exciting missions." After Dragonfly and CAESAR complete their Phase A concept studies, NASA officials will rigorously evaluate the missions to decide which will continue on with development and, eventually, liftoff. "The tremendous success in this mission line comes from the fact that it's so hard to get to it, including that last step, at which, based on a very detailed analysis and a Phase A, the decision is made to take the mission that is most likely to be providing that excellent science and [be] successful overall," Thomas Zurbuchen, associate administrator for NASA's science mission directorate in Washington, said at the conference.